Although Whistler Roof Cleaning and Moss Removal can make your property look great, this service is not for aesthetics alone. The condition of your roof is a major part of the overall welfare of your property. The cost of re-shingling begins in the thousands and goes upward depending on on the size of your property. With the help of Whistler Roof Cleaning and Moss Removal, you can avoid or delay the process of roof re-shingling or reconstruction through proper maintenance. The climate in Whistler, although gorgeous, is perfect for the growth of moss and algae. Large amounts of precipitation as well as shade from the surrounding plant life encourage moisture to build on the surface of a roof as well as in gutters. Excess amount of moisture and organic debris can cause moss and algae to form, leading to clogged gutters and downspouts. As moss takes over the surface of the roof it will hold on to moisture and spread underneath shingles, pulling them up and damaging the roof underneath. If removed improperly, the moss and algae can damage the integrity of the roof. 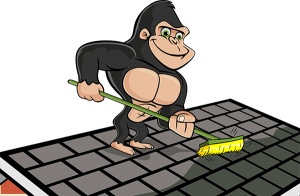 Our Gorillas provide safe and proper Whistler Roof Cleaning and Moss Removal. Although not always done together, Roof Cleaning and Moss Removal and Gutter Cleaning compliment each other greatly, giving your property a full tune-up and leaving it looking like new. No longer must you fear making the climb up to the roof in order to clear off debris. Simply call on our expert technicians and we will be there to assist you with Whistler Roof Cleaning. Our Gorillas take care to carefully survey the property at hand and find the safest course of action. Hard surfaces that remain damp, through moisture retention, are ideal environments for moss and algae to grow and spread, asphalt shingles are prime examples of this. Should there be a build-up on the surface of a roof, the surface could be very slippery. Our Gorillas use tie-offs and state of the art safety equipment to ensure their safety as well as the safety of your property. Leave the climbing to the Gorillas, let us carry out your Roof Cleaning and Moss Removal in Whistler. Call and make an appointment today and let us handle your monkey business.